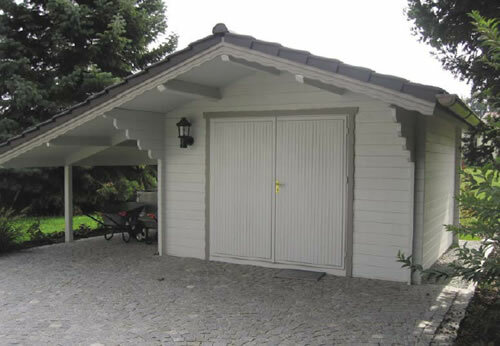 This Garage has been made in the the traditional Log Cabin Style using 45mm solid wall logs. 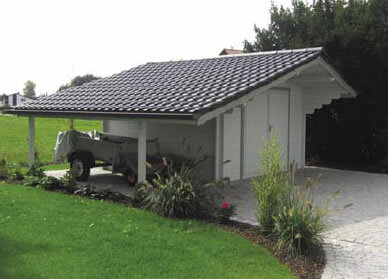 The roof extends to the side of this cabin which creates a handy open storage area. 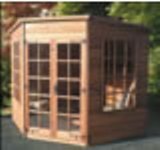 The Garage features sturdy double doors, a side single access door and a tilt-turn double glazed window. Manufactured by Bertsch who are quickly becoming renowned for their outstanding quality which is born out of their German engineering, precision to detail and efficient working techniques. This building is an example of the range as each and every building is manufactured to order and can therefore be tailor made to your individual requirements. Upgrading the wall thickness 70mm or even 94mm. Insulation pack for the roof and floor. Additional windows and doors or partitions. Double Glazed units. Verandas and terraces. Shutters and oval windows. Curved wall steps rather than square logs. Factory painted doors and windows in a choice of colours providing a base coat and two top coats. Complete bespoke manufacturing allowing you to change the size, shape and design. 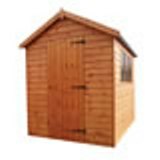 A superior hi-eaves traditional style apex shed 2.44x1.83m with various options available. This is a traditional style world championship table. The smallest from this range of tables. Ideal for use in a log cabin.